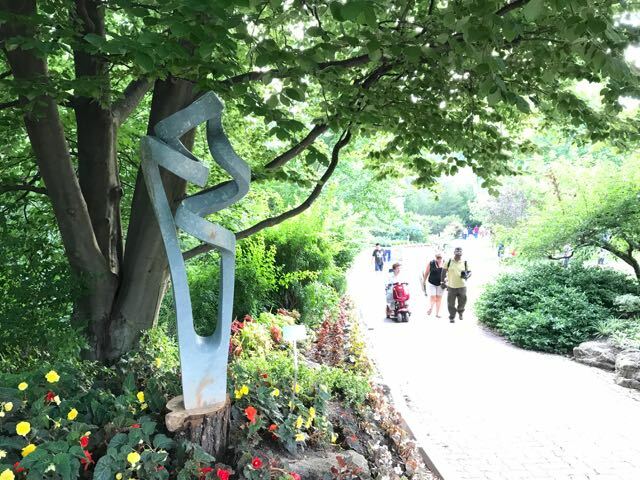 It’s one of the most exciting events to happen at the Toronto Botanical Garden – and visiting is free! 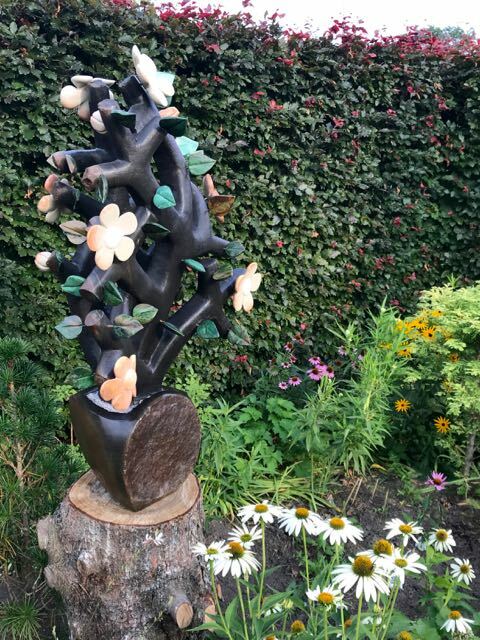 Until September 30, 2018, ZimSculpt brings hundreds of art pieces from Zimbabwe to Toronto for the first time and displays them amongst the greenery of our tiny perfect botanical garden at Leslie and Lawrence. 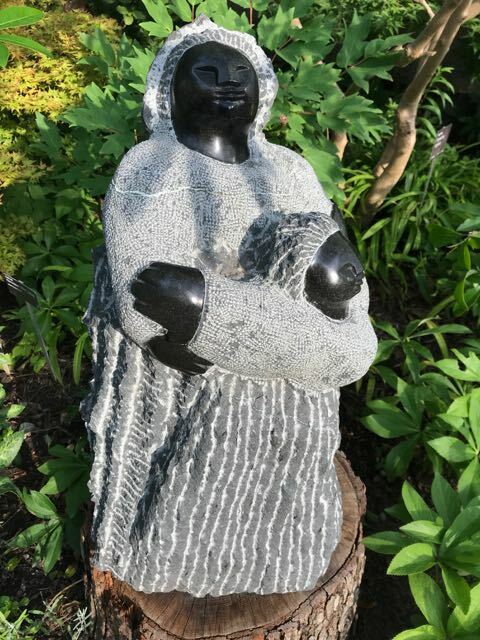 Artistry in the garden and artistry in hand-carved stone bring out the best in each other. 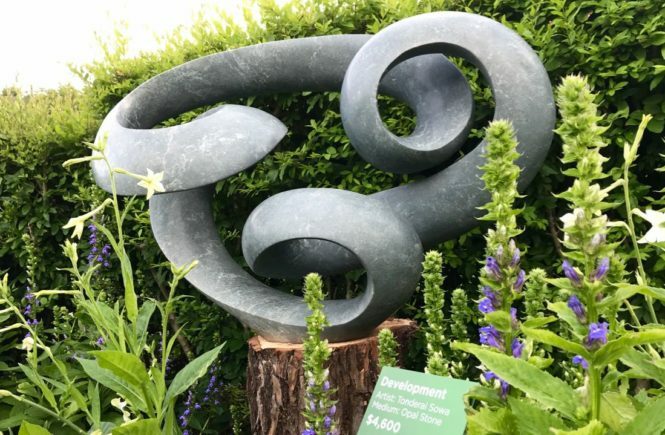 The $1300 price tag on Seed Pod by Albert Wachi was tempting. I’m still thinking about it. 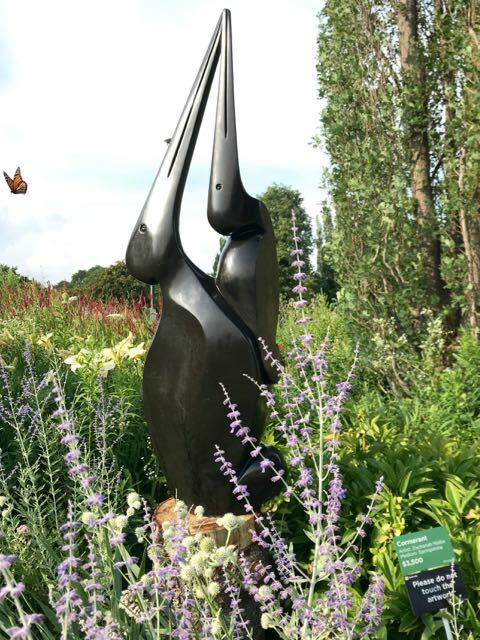 The response to ZimSculpt has been amazing and we’ve received fantastic comments from visitors. I stayed with the VIPs just long enough to hear the intro. Then it was into the gardens with me! TBG exec director Harry Jongerden introduces ZimSculpt’s curators, Vivienne and Joseph Croissette. My inner Introvert responded longingly to Mukore’s sculpture, too. 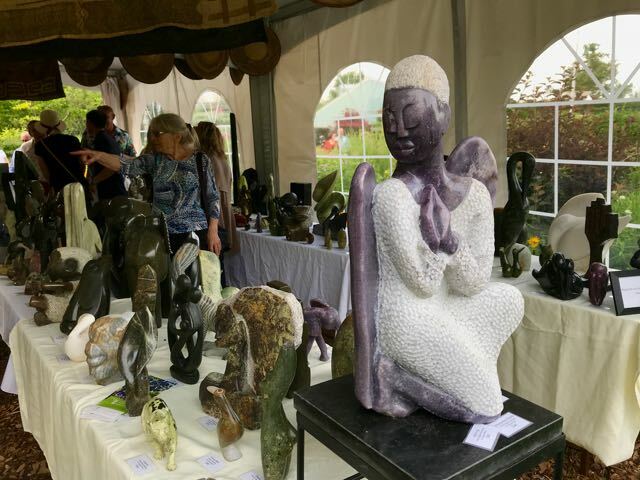 As the ZimSculpt website explains, native Zimbabwean stone – including serpentine, limestone, or springstone – is mined by hand in small batches, and hand chiseled and filed to a texture or polished then glossily finished with wax. Both mining and art activities provide important income for local people. Detail of Fashionable Lady by Collin Sixpence ($1400) shows the contrast of shiny and grainy textures. Some of my favourites were a taaaaaaad out of my price league. Others were surprisingly affordable, especially for original stone sculptures of this calibre. Massive and intricate, Elephant Herd by Tafadzwa Edias Sachiwo comes in at an impressive $11,200. But the “something for everyone” theme also extends to items closer to my price point, including the tiny pieces below. Again, your cursor reveals all. 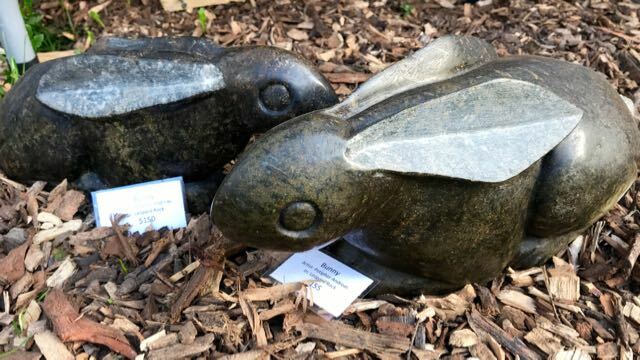 These stone bunnies by Potipher Andreas are priced at $155 and $150. 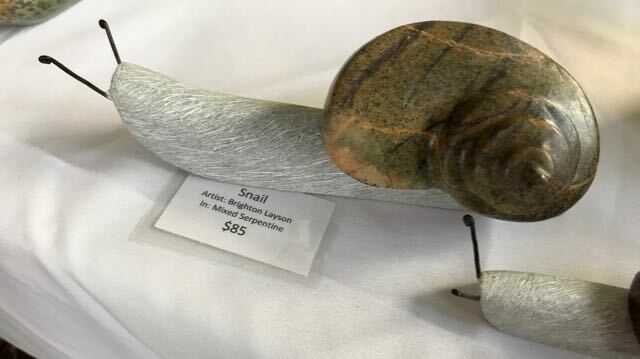 Adorable snails by resident artist Brighton Layson are around $85 each. 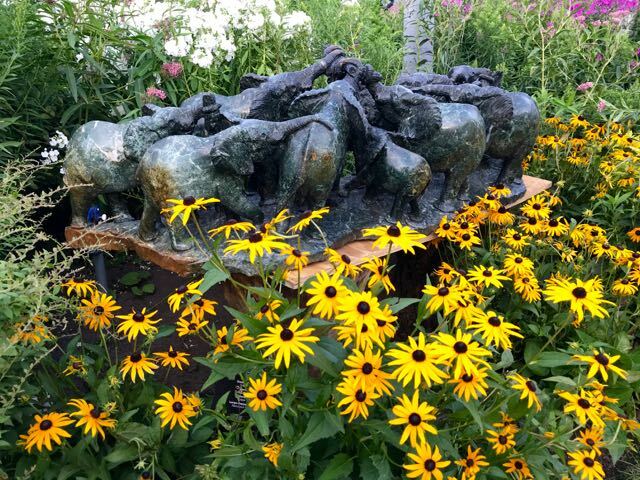 These tiny treasures and other options easily within your reach are found in the marketplace tent in the perennial garden. 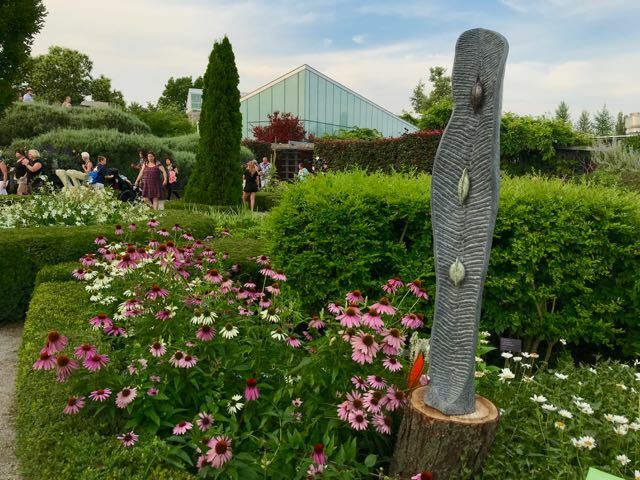 In fact, the interest shown has inspired the TBG to bump up the schedule by adding an hour to the marketplace, now open daily from 10 am to 5 pm, and dusk on Thursdays. Many ways to find your Goldilocks* investment in art (*not too little, not too much, just right!). 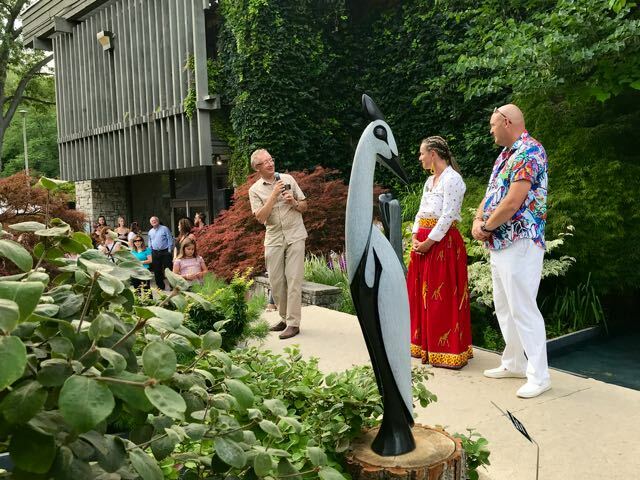 The show is animated with art walks, music nights, meet-the-curator events, and sculpting demos by visiting artists throughout the show period. 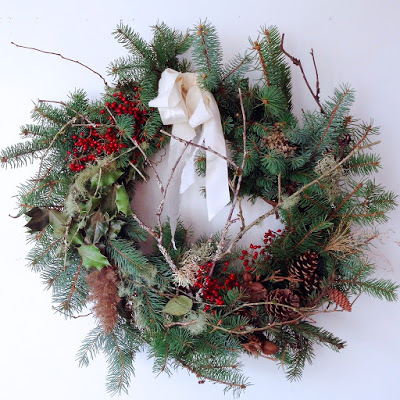 If you don’t find the something you like, you can even commission your own piece from the artists. 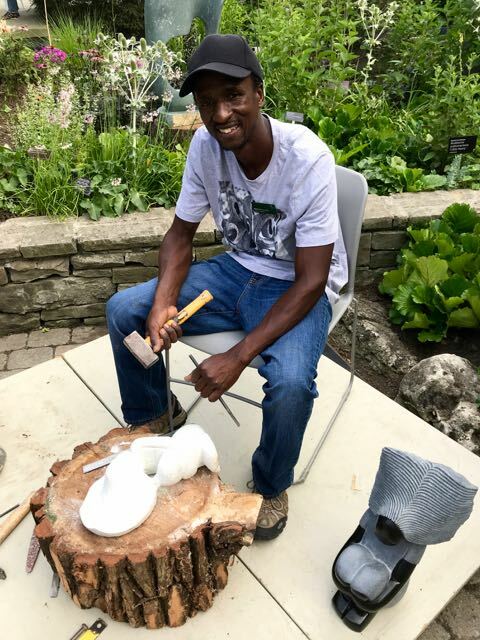 Artist in residence Brighton Layson of Harare demonstrates the transition from raw stone to finished sculpture. Some of the larger pieces – significantly so – are shown in the lower lawns that roll down into the valley. These are so big, they had to be placed with a crane and nightly security keeps them safe from prowlers. 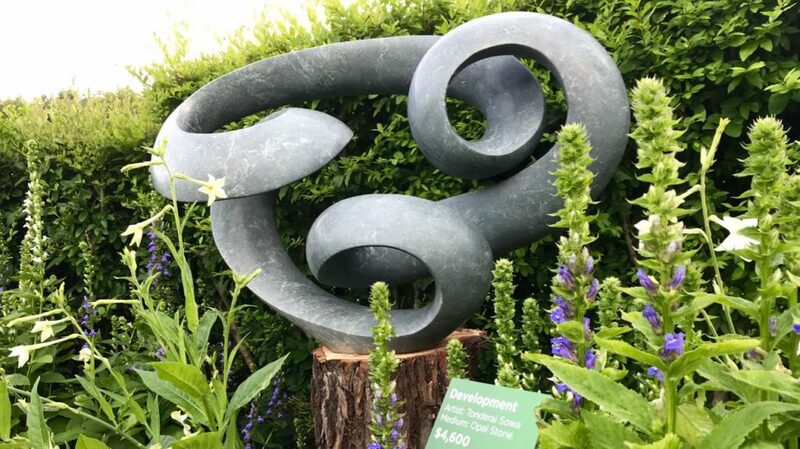 At the top of the slope, Confusion by Bywell Sango ($5200) is carved in a serpentine called opal stone. This is all a sign of big changes to come for the TBG. 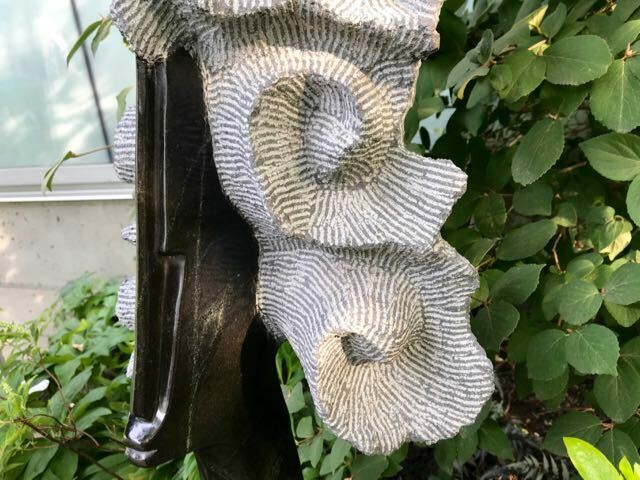 The now-approved merger and redesign of the Toronto Botanical Garden and Edwards Gardens will transform what was once North America’s smallest botanical garden into a real garden destination for Toronto – a home for more attention-getters like ZimSculpt. I can’t wait. Have you been to the show yet? What did you think? An innovative approach — I like it. And like you, many of the more abstract pieces appeal to me. 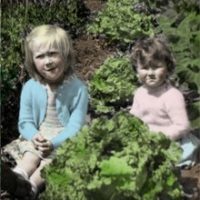 I can imagine some of these pieces in your garden, Pat. 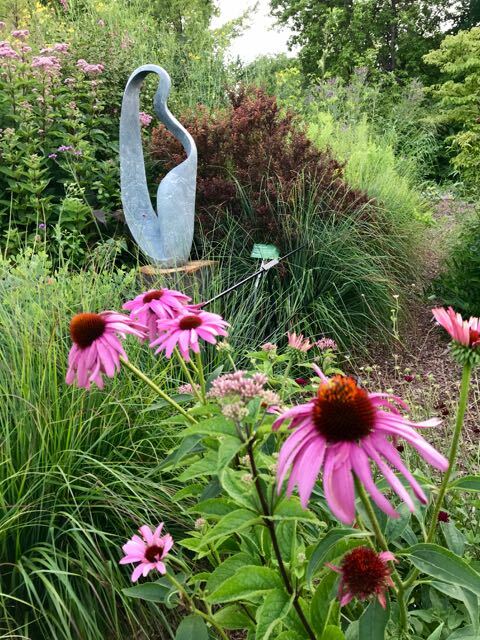 The energy from the pieces coupled with their placements throughput the gardens enhances the experience. I have been already several times and will be returning again wit more family, children and friends. One will leave smiling and wanting more.